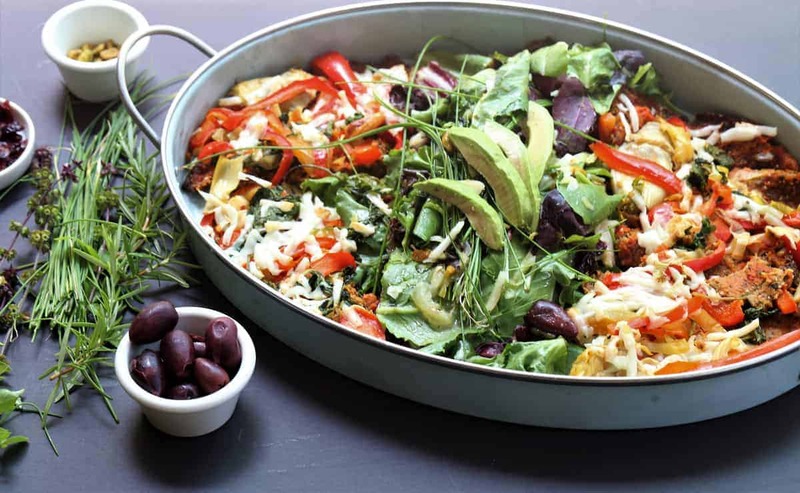 Cauliflower Crust Vegetable Pizza Salad Platter is vegan, gf, dairy free. 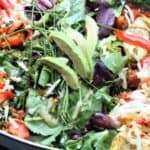 Cauliflower Crust Vegetable Pizza Salad has all the tasty goodness and all the healthy ingredients! There are so many variations of pizza, and somehow, none of them are bad. The challenge for pizza lovers is to find a pizza recipe that is healthy, vegan, gluten free, dairy free and also delicious. Here it is. 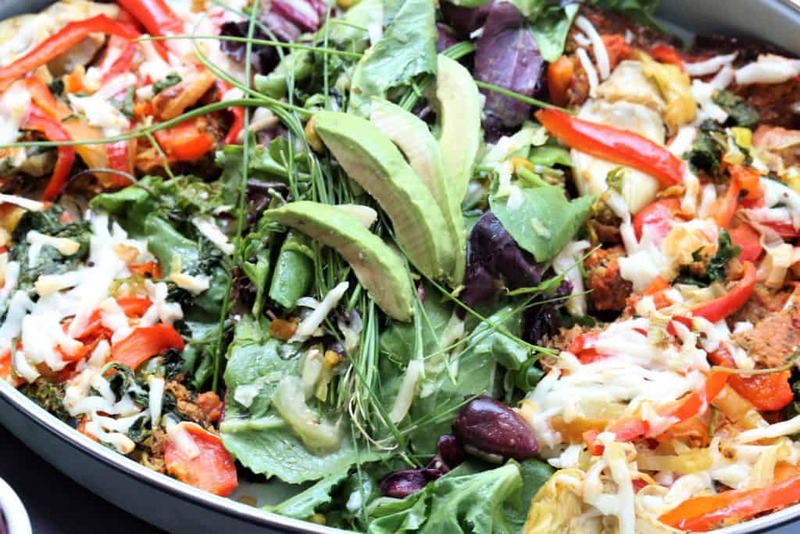 Cauliflower Crust Pizza Salad. Vegetables, cauliflower crust and salad. How can pizza get any better than this? Vegan, gluten free, dairy free. Stirfry cauliflower in 1 tbsp olive oil for 4 minutes on medium heat. Squeeze cauliflower in paper towel to be certain all water is removed. Mix cauliflower in bowl with olive oil, chia seeds, flour and seasonings and form a ball with mixture. Using either round pizza pan or 9x13 rectangle pan, place parchment paper in pan, and press cauliflower mixture into shape of pizza, either round, or rectangular. Stirfry peppers,kale, leeks and artichoke hearts for 5 minutes on high heat. Place vegetables and vegan cheese on pizza crust. *If you prefer, you can spread a minimal amount of your favorite pizza sauce on the crust before topping with vegetables and cheese, but I found that it made the crust soggy, so think that it is better without the sauce. Toss all salad ingredients in bowl and drizzle your favorite dressing over the top. To see more photos, see Instagram.